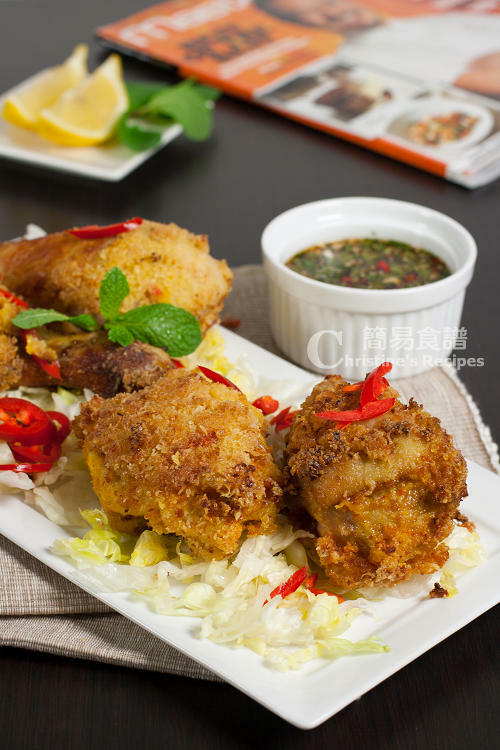 This recipe was created by Adam Liaw who won the title of MasterChef, Australia recently, inspired by fried chicken stalls in Malaysia. The name of the dish, Laksa-Fried Chicken with Mint Sauce, really got my attention. I have ever thought that laksa could be used in frying chicken due to all my previous encounters of laksa in soups. Flipping through the pages of the MasterChef Magazine and browsing all the mouth-watering recipes, I felt this dish was a must to try first. (I made Alvin’s drunken chicken before buying this magazine.) It’s a big hit in my family when the laksa-fried chicken was served on the dining table before my family. My hubby even made a remark that this dish was even better than the roast duck we ate in a restaurant on the day celebrating my birthday. Amongst all the MasterChef magazines I bought, this issue is very special, so to speak, it’s a celebration of the achievements of the top four finalists along the journey in the competition. To me, it’s quite amazing that you’ve found someone who you know via twitting/blogging was mentioned in a magazine right in front of your nose. Congratulations on the feature of your blog, Ellie. 1 tbsp finely chopped Vietnamese mint (or coriander leaves), available from selected greengrocers and Asian grocers. 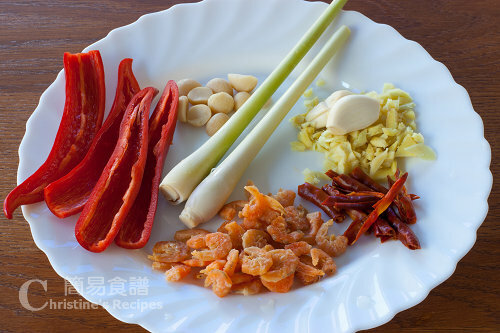 To make curry paste, place dried chillies and shrimp in separate bowls. Cover both with boiling water and soak for 20 minutes. Drain. Process chillies and shrimp with remaining ingredients in a food processor to a paste. 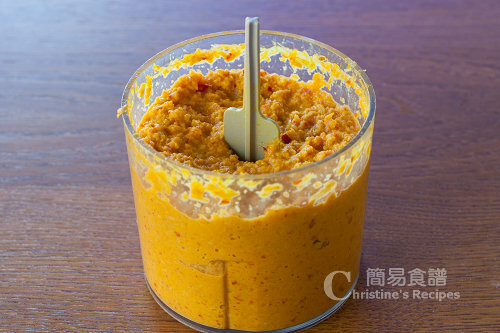 Place chicken pieces and curry paste in a large snap-lock bag. Seal bag, then rub chicken with paste to coat. Refrigerate overnight to marinate. To make mint sauce, place all the ingredients in a screw-top jar and shake well to combine. Set aside until needed. Transfer to an oven tray lined with baking paper and roast for 8 minutes or until cooked. Meanwhile, coat and fry chicken breasts for 8 minutes or until cooked through. Drain on paper towel and transfer to the oven tray to keep warm. Repeat coating with chicken wings, frying for 5 minutes or until cooked through. Drain on paper towel. 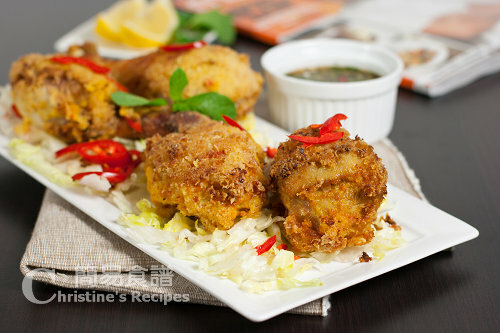 Scatter chicken with fried chilli and season with sea salt. Serve with mint sauce, rice and garlic chives, if using. Ask your butcher to cut the chicken into 2 thighs, 2 legs, 2 wings, and each breast in half on the bone. As I used drumsticks and thighs, I deep-fried them in batches, drumsticks first then followed by thighs. This looks great. I'd like making it one day. I like braising my chicken and spices then bake/deep fry/grill them. By braising the chicken, they have more flavour and cook already before we bake. 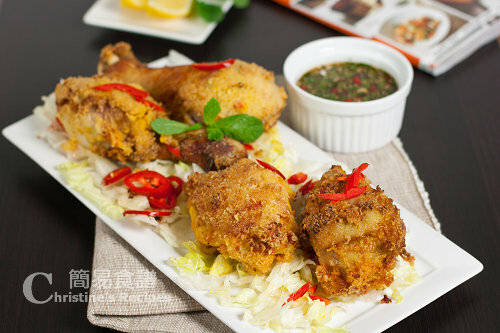 Wow, this fried chicken looks delicious, specially with mint sauce...yummie! Christine, Your chicken looks really good! Adam is a genius to think of using laksa paste as marinade for fried chicken. Thanks for the shout out! Christine, the chicken looks so delicious, I bet is yummy too! Definitely a 'killer' with the mint sauce! Bookmarked! The name caught my attention as well. I like your preparing of laksa paste from scratch; as for deep-fry, allow me to postpone till the weather starts to cool off. Wow...this dish looks awesome! I can just imagine the flavour. Laksa is one of my top favourite. It's awesome that you make your own laksa paste. This dish looks really delicious. Hi Christine! What a terrific find. Thank you for sharing this recipe on your blog. I usually like my fried chicken plain, but the mint sauce sounds terrific. You had me convinced when I saw your picture on twitter. I've got lakes paste ingredients here from some soup I wanted to make before. Oh my gosh, this looks amazing. I love laska, and well, this a must do! Can't wait to try these crusty chicken! Love the addition of coconut shreds in the coating. Beautiful photography and the fried chicken drumsticks look so crispy and tempting. Ah yes I remember Ellie makings these too... looks sooooo good! I'm going to have to try it for sure.